The lost hammer (LH) spring perennially discharges subzero hypersaline reducing brines through thick layers of permafrost and is the only known terrestrial methane seep in frozen settings on Earth. The present study aimed to identify active microbial communities that populate the sediments of the spring outlet, and verify whether such communities vary seasonally and spatially. Microcosm experiments revealed that the biological reduction of sulfur compounds (SR) with hydrogen (e.g., sulfate reduction) was potentially carried out under combined hypersaline and subzero conditions, down to −20 °C, the coldest temperature ever recorded for SR. Pyrosequencing analyses of both 16S rRNA (i.e., cDNA) and 16S rRNA genes (i.e., DNA) of sediments retrieved in late winter and summer indicated fairly stable bacterial and archaeal communities at the phylum level. Potentially active bacterial and archaeal communities were dominated by clades related to the T78 Chloroflexi group and Halobacteria species, respectively. The present study indicated that SR, hydrogenotrophy (possibly coupled to autotrophy), and short-chain alkane degradation (other than methane), most likely represent important, previously unaccounted for, metabolic processes carried out by LH microbial communities. Overall, the obtained findings provided additional evidence that the LH system hosts active communities of anaerobic, halophilic, and cryophilic microorganisms despite the extreme conditions in situ. 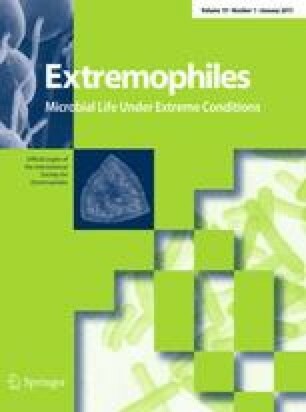 This article is part of a special issue based on the 10th International Congress on Extremophiles held in Saint Petersburg, Russia, September 7–11, 2014. The online version of this article (doi: 10.1007/s00792-014-0703-4) contains supplementary material, which is available to authorized users. We acknowledge the following funding organizations for financial support: the Fond québécois de recherche nature et technologies (FQRNT), the Canadian Astrobiology Training Program (NSERC CREATE CATP), the Northern Science Training Program (NSTP), as well as the Polar and Continental Shelf Project (PCSP) for logistical support in the field.